We are still between European corn borer (ECB) adult generations at this time. 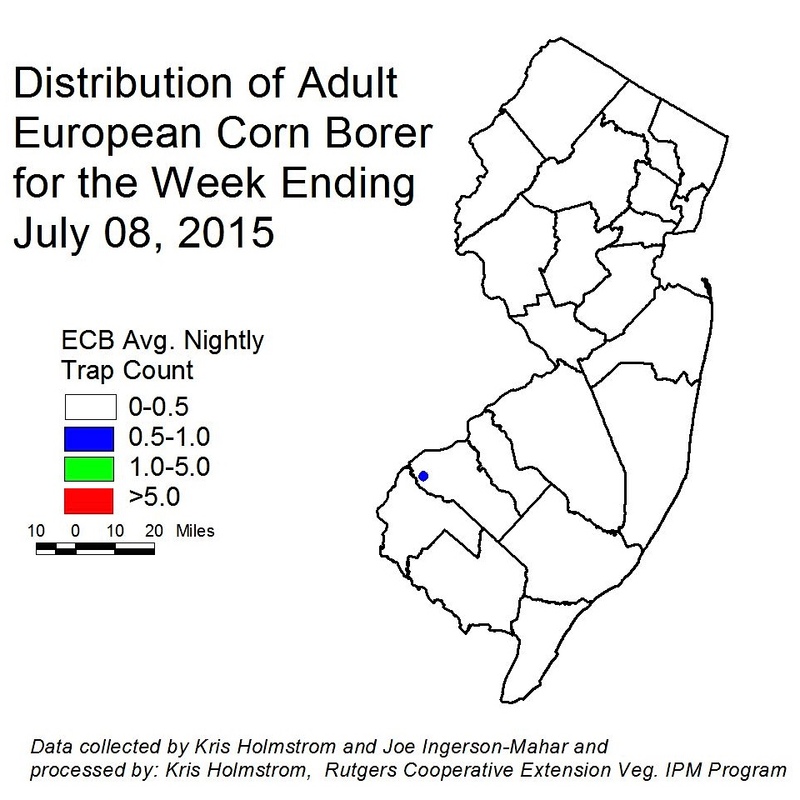 Very few individuals have been captured throughout NJ this past week (see ECB map). ECB infestations are almost gone from all sweet corn plantings. We would expect to see signs of the second flight within the next two weeks. 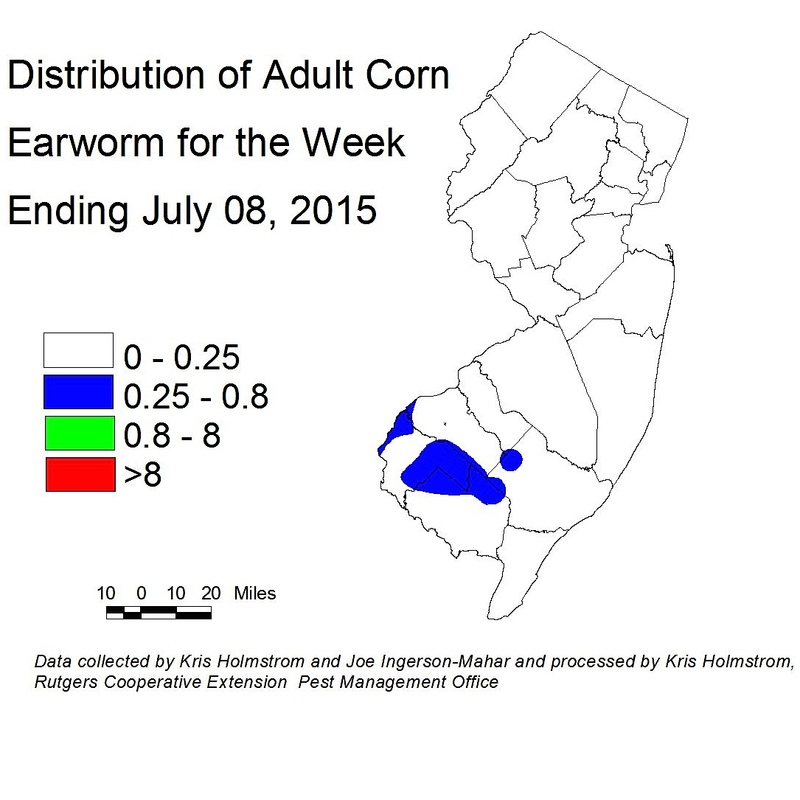 There has been little change in catches of corn earworm moths (CEW) in blacklights this past week. Overall activity is quite low, and is primarily focused in the Atlantic-Cumberland-Salem County area (see CEW Map). The limited CEW pheromone trap network in the southern counties has registered a slight increase in moths captured over the past week. Western Salem and Gloucester counties have the highest activity, along with western Atlantic County (see CEW pheromone map). The low number of traps results in broad areas of color within the map. With many sweet corn plantings now in silk, it is critical that growers monitor local CEW moth numbers. At present, reasonably light silk spray schedules should be adequate to limit CEW injury as well as to prevent ear damage from ECB larvae that already inhabit the stalks. For sinking sweet corn, the following spray schedules are warranted. 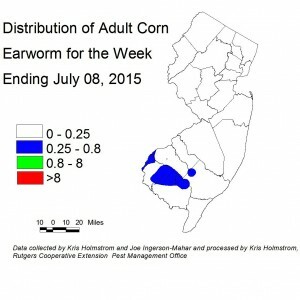 Low level fall armyworm (FAW) infestations continue to appear throughout NJ. Very few FAW moths have been captured in the region, so the threat of increased infestations in the near term seems low. However, this pest can be devastating to small corn plants. Fields down to seedling stage should be scouted weekly for signs of infestation. Recent weather has been conducive for the spread of the late blight. Despite this, no new sites have been discovered since the two locations in central Morris County earlier this week. 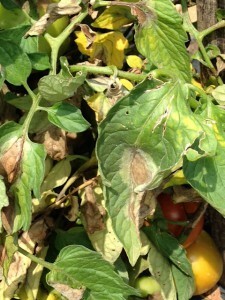 Tomato growers should continue to protect all plantings against this disease, particularly while wet weather persists. Late blight infections result in rapidly expanding necrotic lesions on leaves, with tissue death occurring very quickly (see photo 1). There will be a whitish haze of spores at the margins of the lesions. Petioles are also affected, and infections on green fruit result in brown spots that remain firm (see photo 2). Consult the 2015 Commercial Vegetable Recommendations Guide for fungicides effective against late blight. 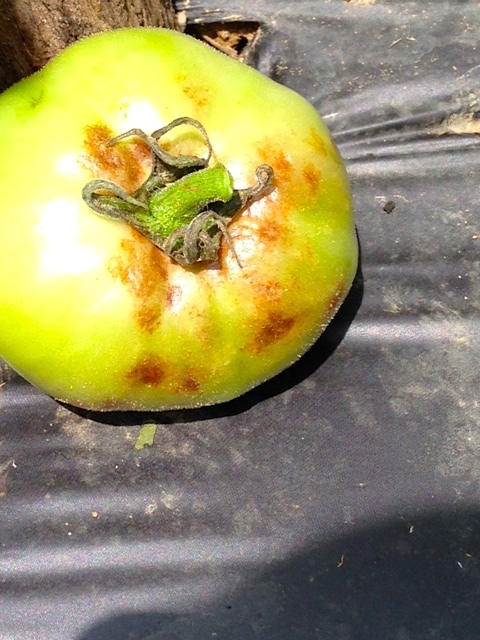 Late blight foliar leasion on tomato. Late blight fruit lesion on tomato. Wet weather also favors the development and spread of bacterial infections. Bacterial leaf spot and bacterial canker (see photo of foliar symptoms) can easily be spread by workers when foliage is wet. Avoid fields as much as possible when they are wet. Always work in youngest plantings first, to avoid bring infections to younger plants. Maintain rigorous anti-bacterial spray programs. Consult the 2015 Commercial Vegetable Recommendations Guide for effective materials. 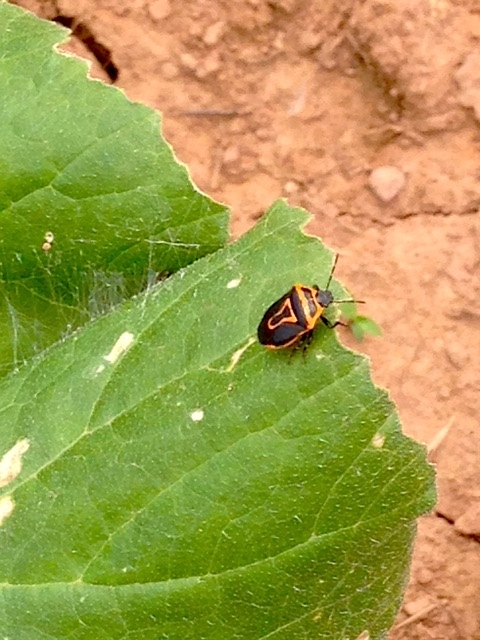 Recently, IPM scouts have discovered a number of the beneficial two-spotted stinkbug, Perillus bioculatus (see photo) in tomato plantings. Do not be alarmed to see this bug, as it is highly predatory on other insects and is particularly fond of eating Colorado potato beetle larvae. The trend continues – no weevils were trapped in the past week at any location. As far as known, there are no infested fields at this time. 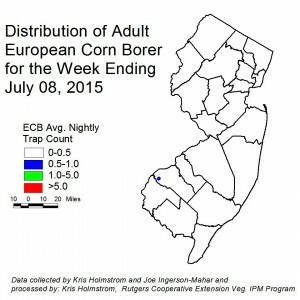 Only a few individual BMSB were captured in NJ blacklight traps this past week. These catches are too low to create a map. These crops are now established in many areas. 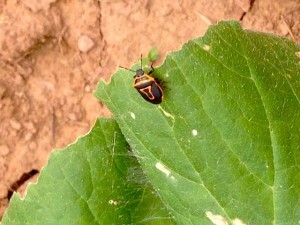 It is important to monitor frequently for the presence of striped cucumber beetles at this time, particularly if the seed was not purchased pre-treated with an insecticide for cucumber beetle. Check 5 consecutive plants each in 10 random locations. Examine upper and lower surface of seed leaves for the presence of beetles. Consider treating if beetles are found at 5 or more sites. Heavy, but local infestations may be spot treated. Management of these pests will limit the loss of plants to the bacterial wilt disease that the beetles transmit. A sentinel plot containing susceptible and resistant cucumber varieties, as well as muskmelons, watermelons, acorn and butternut squash and pumpkins has been established at the Snyder Research and Extension Farm in Hunterdon County. The purpose of this plot is to detect the presence of downy mildew (DM) in NJ. Any occurrence will be reported in this newsletter and will also generate an alert to all subscribers. At this time, DM is present on cucumbers in eastern Pennsylvania and on watermelon in Delaware and Maryland. For more information on the regional presence of DM as well as comprehensive, weekly forecasts, see the following website: http://cdm.ipmpipe.org/ The cucurbit downy mildew forecast has NJ at high risk of infection from reported infection sites in neighboring states. As yet, there are no reports of DM in pumpkins and winter squash. No DM has been found at Snyder Farm to date.